In the excitement of the FIFA World Cup last summer, I found myself asking, “does soccer relate to nanotechnology in any way?” After doing some research, my honest answer is, not really. However, while doing my research, I did discover that researchers at the National Institute of Standards and Technology are playing “nano soccer games” to test the capabilities of recent advances in nanorobotics. The soccer game included moving a soccer ball no larger than the width of a human hair around on a soccer field smaller than a grain of rice. Not sure who to root for, but I found this footage to be very amusing (see video below). Since I could not find any more overlap between soccer and nanotechnology, I decided I would check out more on nanorobots. I found out that this awesome concept of nanorobotics is actually an emerging field within nanotechnology that uses machines with critical components on the nanoscale (one billionth of a meter). Therefore even microsized robots (one millionth of a meter) could be considered nanorobots as long as they perform a task at the nanoscale such as moving with nanoscale precision. Although nanorobots are incredibly exciting and awe-inspiring, the uses of nanorobots are unfortunately still in the early stages of development. Nonetheless, they have exhibited capabilities that may someday be useful in treating cancer and repairing DNA.1 Nanorobots might also be used to detect individual molecules of environmental contaminants.1 While these applications sound amazing, actually manufacturing these nanorobots is a task that we humans have not yet mastered. Using nanorobots to kill cancer cells in humans is one example of an interesting potential application of this nascent technology.2 For this to happen a nanorobot would have to be able to travel throughout the blood stream targeting only the cells that are cancerous. Once the nanorobot pinpointed these cancer cells, it would then have to release a drug that would be able to destroy them.1 This is a really cool concept in theory; however, constructing a nanorobot with the ability to seek out individual cancer cells in an environment as complex as the human body posses some serious challenges. While the challenges of nanorobot navigation are ever present, researchers have been making some headway in this area. I was surprised to find that several years ago researchers at Rice University made the first ever nanocar, just a couple nanometers in length.4 The nanocar uses two pairs of carbon nanospheres called “bucky balls” as wheels. This nanocar drives on a bed of gold atoms, but only when you heat the car up to between 170 °C and 225 °C (follow this link to view the cars moving, which appear as fluorescent dots).4 Researchers at Rice University also built a nano-truck, which holds nano-sized cargo, but I don’t think we will see these on the highways anytime soon. This lumpy looking nanocar invented by the researchers at Rice University is actually quite high-tech and extremely small (only a few nanometers across). Image reprinted with permission from Shirai et al. Copyright 2005 American Chemical Society. Another group at the NanoRobotics Laboratory in Montreal has developed a microsized robot able to move within the artery of a living animal. This robot has the incredible ability to travel up to speeds of 10 centimeters per second or 0.22 mph (that’s fast for a microsized object! ).5 Their future plans include shrinking this microsized robot to the nanoscale. After reading about all these exciting advancements and breakthroughs in nanotechnology, I wondered about the benefits of having this technology around and if there would be any downfalls. Medicinal benefits were the first that really came to my mind especially after seeing the nanorobots in action, but it was much harder for me to imagine any possible downfalls to using nanotechnology. I then remembered that, like any other material, they could pose a threat if we don’t create them responsibly. If we think back to the times when asbestos and pesticides like DDT were causing problems for both human and environmental health it is not hard to imagine that nanomaterials might do the same. This is all the more reason to keep actively researching how to develop these materials in the safest way possible. For me, I hope to be hearing a lot more about these fascinating machines. I would especially love to see nanorobots and nanomaterials integrated in everyday life in important areas like medicine, energy production and technology. Although I feel this way I still think it is important that we figure out how to safely design these materials so we won’t have to worry about nanorobots causing unwanted environmental or human health damage. For now I will keep thinking about everyday life and how it might relate to nanotechnology, as it has already taken me on some pretty awesome adventures. Patel, Geeta M., Gayatri C. Patel, Ritesh B. Patel, Jayvadan K. Patel, and Madhabhai Patel. 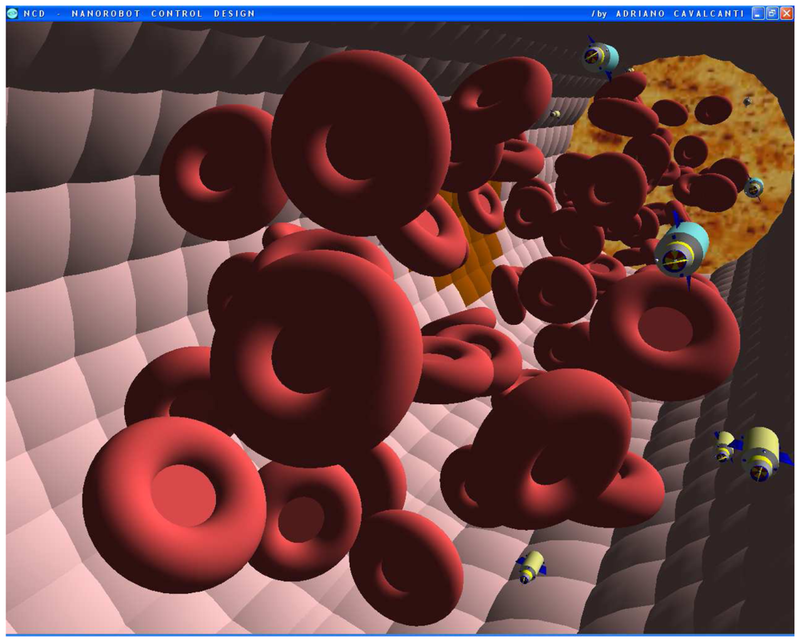 “Nanorobot: A Versatile Tool in Nanomedicine.” Journal of Drug Targeting 14.2 (2006): 63-67. Freitas, Robert A. Nanomedicine, Volume I: Basic Capabilities. Austin: Landes Bioscience, 1999. Cavalcanti, Adriano, Bijan Shirinzadeh, Mingjun Zhang, and Luiz C. Kretly. “Nanorobot Hardware Architecture for Medical Defense.” Sensors 8.5 (2008): 2932-958. Shirai, Yasuhiro, Andrew J. Osgood, Yuming Zhao, Kevin F. Kelly, and James M. Tour. 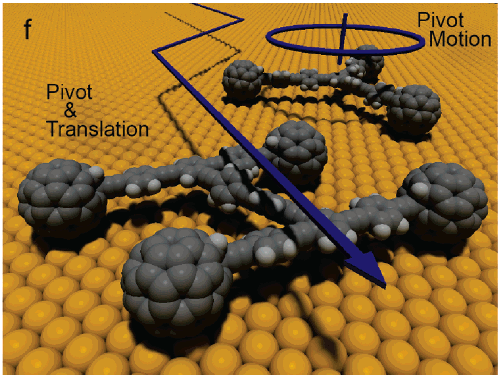 “Directional Control in Thermally Driven Single-Molecule Nanocars.” Nano Letters 5.11 (2005): 2330-334. Ecole Polytechnique de Montreal. “World First in Medical Robotics: Researchers Successfully Control Wireless Device Inside Artery.” ScienceDaily 19 March 2007.